The White House Ornament Collection presents The 2004 Rutherford B. Hayes Ornament. 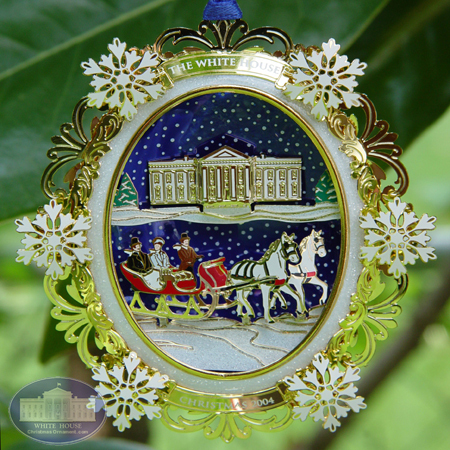 Inspired by President Hayes love to take his family and guest on sleigh rides around the hill Washington DC, this hand-painted oval niche keepsake is handsomely decorated by a 24-carat, gold-finished brass frame with enameled colors. The reverse shimmers with white snowflakes against an enameled royal blue sky.